AccuWeather announced Jan. 4 that Myers had stepped down from his positions at AccuWeather and sold his stake in the company, effective Jan. 1. His wife, who had spent 35 years at the company, also left AccuWeather at the same time. 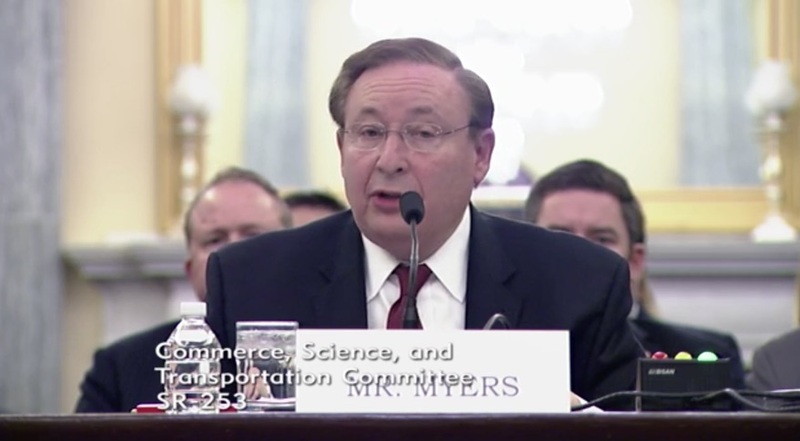 “In accordance with the ethics pledge from Myers to the U.S. Office of Government Ethics and in his testimony and comments made to the U.S. Senate, he has fulfilled his commitment to fully divest himself of AccuWeather and of any and all related interests,” the company said. The administration also resubmitted the nomination of Kimberly Reed to be president of the Ex-Im Bank and for Spencer Bachus III, Judith DelZoppo Pryor and Claudia Slacik to serve on its board of directors. All had been previously nominated by the administration, and the Senate Banking Committee had favorably reported them, but the full Senate did not take up their nominations. The bank, which provides export credit financing for American companies, currently lacks a quorum on its board. That prevents the bank from approving any deals larger than $10 million, which effectively excludes it from supporting any commercial satellite or launch deals, work that the bank had supported when it was fully functioning.